What is the difference between item in cart and item in cart (multiplied)? The Discount Method below has a rule that evaluates "is there an item in the cart that contains (is equal to) EX03WHT1002?" If this is true then the discount action takes place. If it is false then nothing happens. My cart contains (is equal to) EX03WHT1002 so I receive the $10 discount on the item. But lets say I have a quantity of 3 EX03WHT1002 in the cart. I only get the discount once. 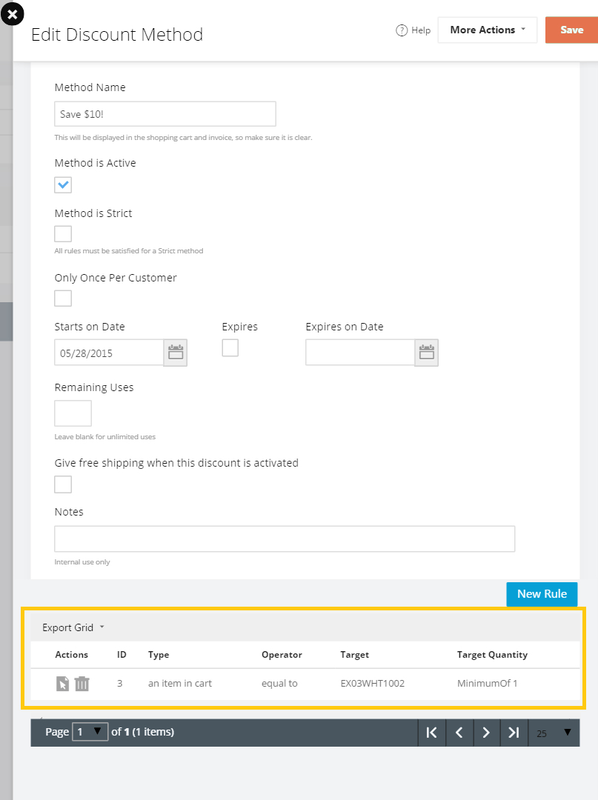 If I want to get the discount for each instance of EX03WHT1002 in the cart I need to use "an item in cart (multiplied)". Now when I change the quantity to 3 I get the discount for each instance of EX03WHT1002 in the cart.